Indigenous Australian artist Rover Thomas was born in about 1926 in the Great Sandy Desert of Western Australia, in remote Gunawaggi, Well 33 on the Canning Stock Route into the Joolama subsection and Kukatja/ Wangkajunga language group. Following the death of his mother when he was 10 years old, Rover moved to Billiluna Station. After being initiated into traditional law, Rover began work as a jackeroo in Wyndham and the Northern Territory before returning to Western Australia where he worked as a stockman on several Stations including Bow River Station where he married his first wife. After several years, Rover moved into the Noonkanbah community with his second wife, then moved to Warmum where he worked as a carpenter’s assistant. In 1975 Rover came across the open ceremony of the Gurirr Gurirr (Kril Kril) in which pieces of plywood were painted with ochre and carried on the shoulders of participants to complement specific song verses. Rover Thomas and his classificatory uncle Paddy Jaminji painted many of these works on board. Mary Macha, Manager of Aboriginal Traditional Arts, Perth began to market their work in about 1983 –84. A few years later Rover began to paint for Waringarri Aboriginal Arts, Kununurra. Later in his life Rover lived at Turkey Creek. It was here that the artist teamed up with his friend Paddy Tjamati in a departure from the traditional method of painting tribal art on canvas, experimenting instead with landscapes painted on dismembered tea chests. Rover’s landscapes reflect the artist’s inherent understanding and oneness with his country: portraying a powerful and vibrant living entity, made up, not just of the physical landscape, but also of the changing family gathering, past and present, that breathed life into and on the earth. Rover’s minimalist abstract works are at once contemporary and ancient, most painted in the ochres and umber colours of his native land. On board or canvas, Rover was the illustrator and storyteller of this vibrant totality. ‘Places’ were presented with pared back, dot-defined blocks and forms portraying the features and structures of the landscape with the underlying presence of another story: emblems and structures that tell their historical and mythological stories. Although in ill health, a return to Yelda, the land of his conception and birth inspired his last major creative project which resulted in a series of works exhibited in 1995 at William Mora Gallery in Melbourne. Until his death in 1998, Rover lived as a respected elder in the Warmun community. Rover Thomas was awarded the John McCaughey Prize for the best painting Blancher country, displayed in 1990 at the Art Gallery of New South Wales, Sydney. In 1991 he represented Australia at the Venice Biennale, with Trevor Nickolls. 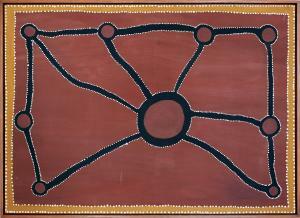 Rover was the subject of the important solo exhibition Roads Cross: The Paintings of Rover Thomas, National Gallery of Australia, Canberra in 1994. Rover Thomas Joolama remains one of the most successful Australian artists on both the national and international art scene.